Street Fighter V is poised to be released next month on PlayStation 4. Hot on the heels of that, UDON is planning to bring two Street Fighter titles to comic shops in March. 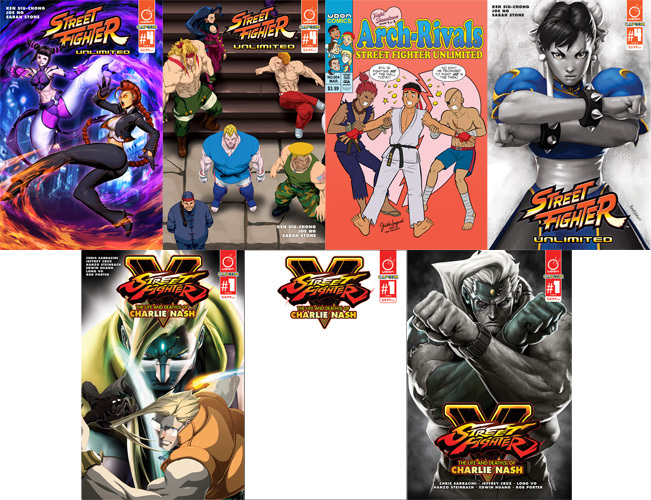 Both Street Fighter Unlimited #4 and Street Fighter V: The Life and Death(s) of Charlie Nash #1 are available for order now. In Street Fighter Unlimited #4, series writer Ken Siu-chong and artist Joe Ng conclude the first story arc of the ongoing series as Ryu encounters a ghost from his past and Guile, Cammy, Alex and Chun-Li struggle to survive the onslaught of Vega's new minions. This issue also features a 4-page bonus story illustrated by Sarah Stone starring the deadly damsels of S.I.N – Juri VS. Crimson Viper! This issue features two standard covers by Gonzalo “Genzoman” Ordonez Arias and Jeffrey “Chamba” Cruz, as well as two special incentive variants. Gisèle Lagacé provides the “Arch-Rivals” homage variant, while Steve “Kandoken” Mack provides a Street Fighter V variant of the leading lady of fighting games – Chun-li! Also available in March is Street Fighter V: The Life and Death(s) of Charlie Nash #1, a 48-page one-shot delving into the past of this recently returned fighter. This oversized special features a cavalcade of UDON creators, including writer Chris Sarracini and artists Jeffrey Cruz, Hanzo Steinbach, Edwin Huang, Long Vo and Rob Porter. This title features a standard cover by Jeffrey Cruz, a special Black Sketch variant, and an incentive cover by Steve Mack.